Dimethyldicyane,DACM,MACM - ZhangJia Gang YaRui Chemical Co., Ltd.
5, Used In Polyaspartic Esters, Polyamide (PA) And So On. 6, For The Synthesis Of Isocyanates, Further Prepared Into UV Paint, PU Paint, Transparent Elastomers And Adhesives, Etc., In Addition, Also Used In Polyamide And Epoxy Resin Industry. Recommended Dosage: Mixture Ratio 100:32 (Relative To EEW=190 Epoxy Resin), Useable Time 400min (25° 150g). 3,3'-Dimethyl-4,4'-Diaminodicyclohexylmethane (Cycloamylamine Curing Agent Chain Extender DACM, MACM) Package Storage: Steel Drum, 180kg/Barrel. Keep Away From Fire, Heat, And Light. Store In A Closed Container And Store In A Cool, Dry, Well-Ventilated Place Away From Strong Oxidants, Acids, And Other Incompatible Materials. According To Flammable Chemicals, Corrosion Products Storage And Transportation. 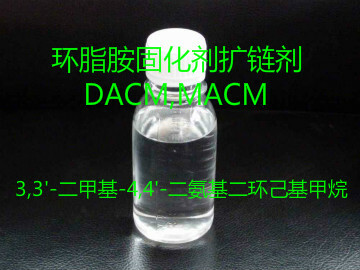 If Dimethyldicyane,DACM,MACM product is not what you want, we can be customized according to your needs, please send us your order to Email: sales@yaruichem.com , or click here to post your buying lead.